Have you even iust laid in bed at night and cried? life pops into your head and makes you cry even more. those bad things....but they just keep multiplying. 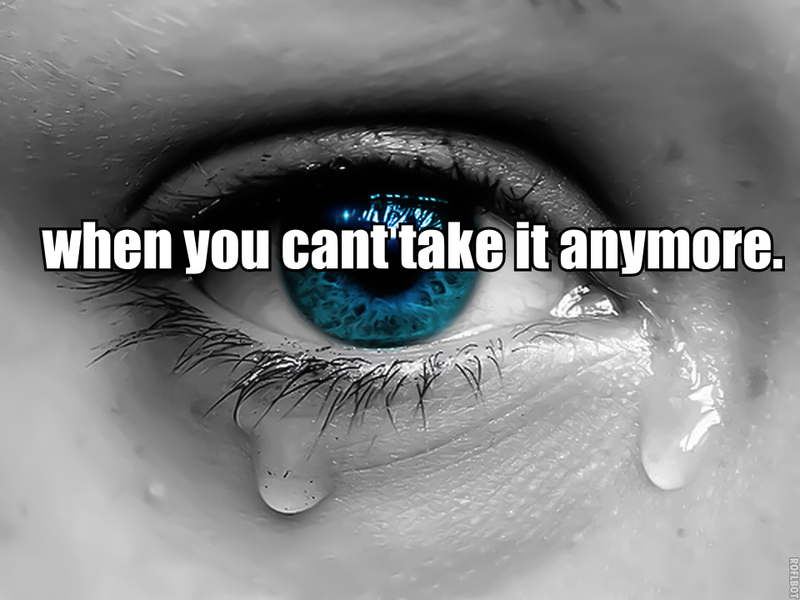 when you cant take it anymore. The trouble with crying over an onion is that once the chopping gets you started and the tears begin to well up, the next thing you know you just canât stop! Haven't laughed this hard in a long time. I better stop now before I start crying. Go off to sleep in the sunshine...I don't want to see the day when its dying. A woman shaking in fear from demons in her mind, and the old man who loves her more deeply than life itself, crying softly in the corner, his face in his hands. None of us lie or guard our secrets when we sing, and India is a nation of singers whose first love is the kind of song we turn to when crying just isn't enough. 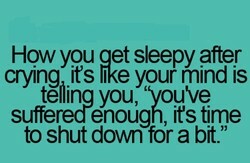 For some reason people say such negative things about having a baby - you won't sleep, the stress, the crying. Nonsense. It's a total joy so cherish every second. I canât even think about what life âcould have beenâ like in Boston, without crying. Itâs like deja-vu, I donât think me and Boston were ever meant to be. Laughing doesn't make bad things worse any more than crying makes them better. It doesn't mean you don't care, or that you've forgotten. It just means you're human. Oh the folly of any mind that would explain God before obeying Him! That would map out the character of God instead of crying, Lord, what wouldst thou have me to do? 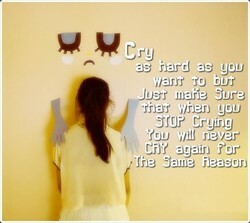 When I am happy I feel like crying, but when I am sad I donât feel like laughing. I think it is better to be happy; then you get two feelings for the price of one. 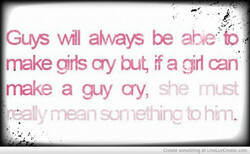 I cry secretly. 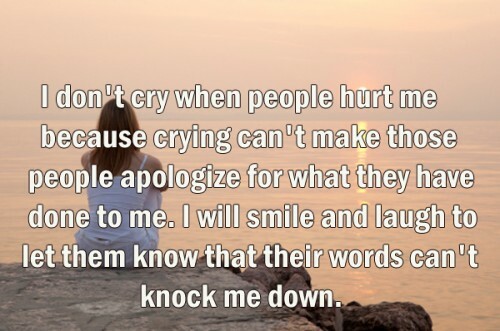 I don't really cry in front of anybody. I hate crying. I feel like it's not accomplishing anything. But when I lost my mother, I cried, and I cried big. Remember, someone, somewhere in some corner of this somewhat big world, is out there crying if you're unhappy and is happy if you are! And you know who that someone is! 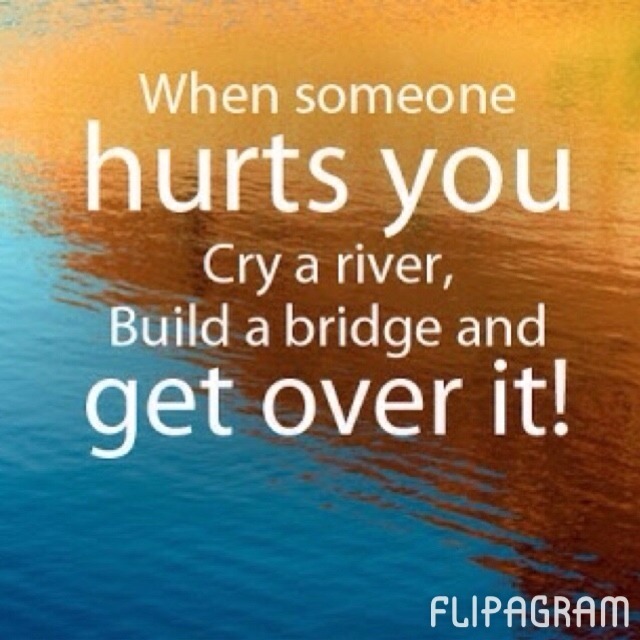 You don't actually get over things"¦ you incorporate them. They become part of everything you are. 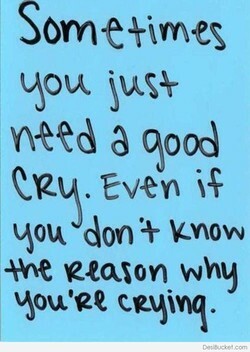 I don't mean that you walk about crying all the time. But you change. Those who try to lead the people can only do so by following the mob. It is through the voice of one crying in the wilderness that the ways of the gods must be prepared. The mind wants to forget because it weighs so much on the heart and soul. 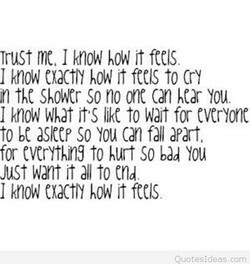 I am tired of crying and feeling so helpless. I want to breathe again -just for a little while. 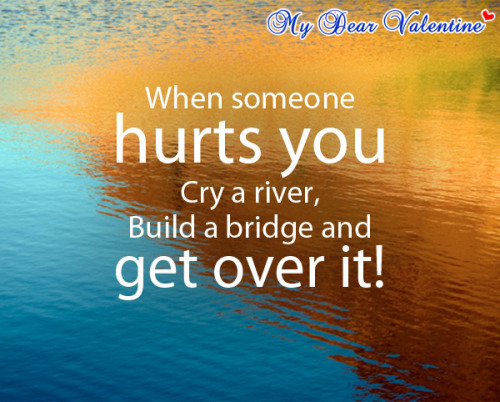 When you hear bad things about yourself, just put your energies into something else; it's no good crying about it. 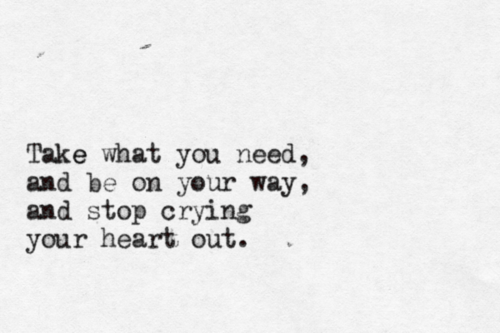 Just put it into your music - it'll make you stronger. Some girl asked me for an autograph and I asked her why, she said because she admires me. I said she should see a shrink. Then she started crying and I started laughing. At long last, she gasped out, "It's Seth." "What happened?" I demanded. "Is he okay?" "He ended it." Her crying renewed. "He broke the engagement and told me it was over. If my father could have sat up in bed and said goodbye, I'd have pressed the button. I wouldn't have been able to see for crying, but I would have considered that a duty. I commend you, however, for passing the time in as merry a manner as you possibly could; it is assuredly better to go laughing than crying thro' the rough journey of life. Work hard. Don't quit. Be appreciative, be thankful, be grateful, be respectful. Also, never whine, never complain. And always, for crying out loud, keep a sense of humor. I think it was wonderful when Princess Di died so that everyone could cry in unison. I thought that the crying together was the most powerful gift that she gave in her death. Guys always think tears are a sign of weakness. Theyâre a sign of FRUSTRATION. Sheâs only crying so she wonât cut your throat in your sleep. So make nice and be grateful. I leaned back against him and rested my cheek on his shoulder. I could feel the river water dripping off of him. "Thank you" I whispered. When I looked up, I saw he was crying. Youâve been here before. It wonât kill you. It feels like you canât breathe, but you actually are breathing. 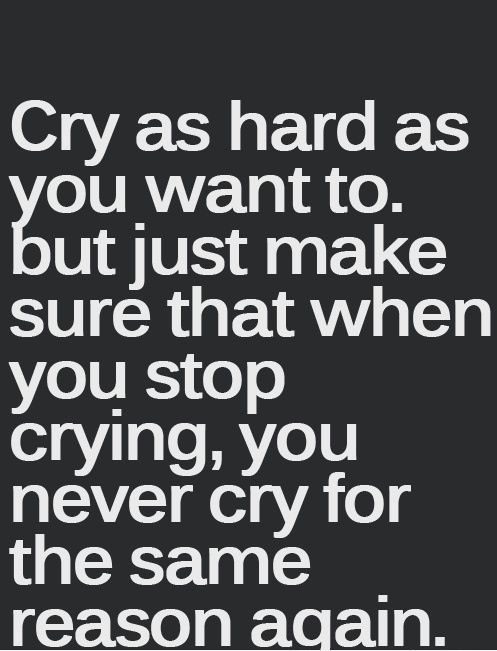 It feels like youâll never stop crying, but you actually will. 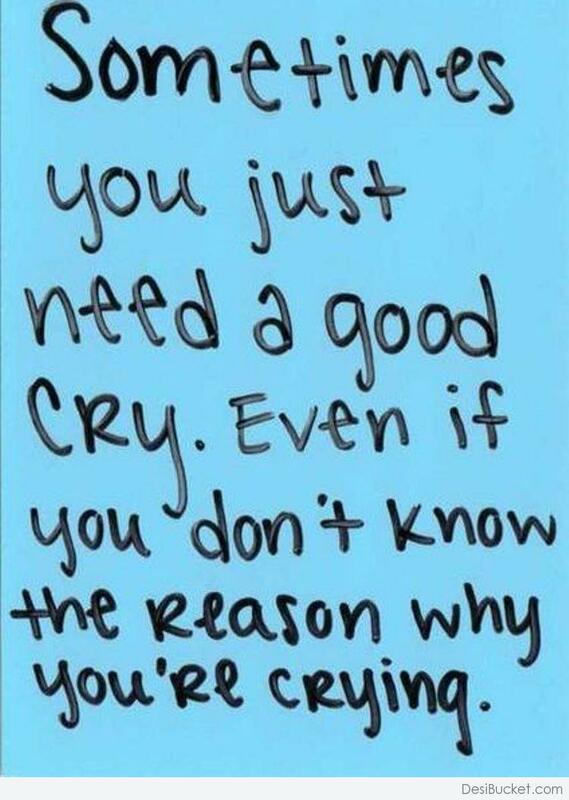 I get really upset seeing my friends who are mums crying because they feel like they're not good enough. Clever, confident, kind young women all going, 'I'm ruining my child's life. I thought she'd [her mother] offer me some sympathy. 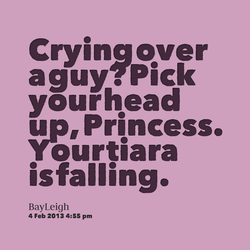 Instead, she said, 'Don't you ever call me crying again! You wanted to be in this business, so you better toughen up!' And I did. It takes years to establish yourself, and then you have one big film and everyone calls you an overnight success. You think, 'Christ, I've been sweating and crying for seven years.'. Tiresome heart, forever living and dying, House without air, I leave you and lock your door. Wild swans, come over the town, come over The town again, trailing your legs and crying! There must be a remedy even for such a crying evil as this [abortion]. But where shall it be found, at least where begin, if not in the complete enfranchisement and elevation of women? I wish everyone would stop crying, Tom. Uncle Joe would be so angry about it." 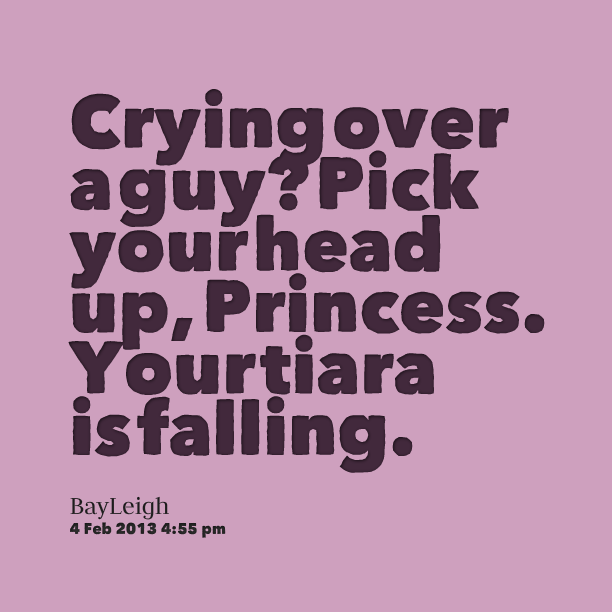 But she's crying herself now. "He'd be so angry at us, Tom, for crying so much when all he did was laugh. The Fed wants to raise rates because they've been yelling and screaming about it. They've been crying wolf for so long that their credibility is shot, and I think they feel they need to. I'm the rap version of Dave Chappelle. I'm not sayin' I'm nearly as talented as Chappelle when it comes to political and social commentary, but like him, I'm laughing to keep from crying. Now I see that all relationships are virtual, even those that take place in person. Whether we use our bodies or a keyboard, it all comes down to two minds crying out from their solitude. This might end up in crying. If you're not prepared to cry about it, I'm not sure you're making art. And if you're not prepared to dance in anticipation, you're definitely not making art. I really like older British guys - I don't think any of them would ever have a problem with crying in front of a woman or saying "I love you" or "You hurt me" or emotional stuff like that. One breath at a time. One day at a time. Wake up, and be shredded. 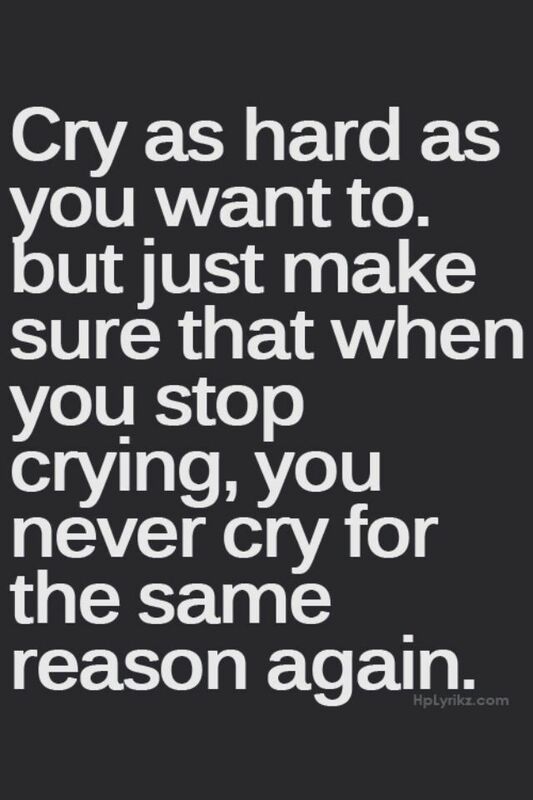 Cry for a while. 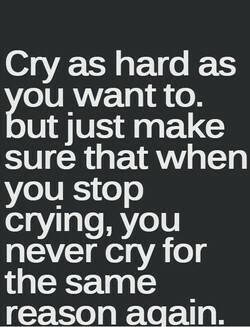 Then stop crying and go about your day. You're not okay, but you're alive, and you will be okay, someday. When I go to the Boston Marathon now, I have wet shouldersâwomen fall into my arms crying. They're weeping for joy because running has changed their lives. They feel they can do anything. There is nothing else for you to do but to truly love and nourish the emotionally and spiritually starved parts of you that are crying out for your attention. Are you loving all of yourself? My parents were in the studio when we cut 'Let Me Try' and every time I sang it they started crying, ... I finally had to ask them to leave because I couldn't sing it while they were crying. Why can't the world be simpler, like it is for guinea pigs? They only have a few rules: Crying will get you attention. If it fits in your mouth, it's food. Scream if you don't get your share. Look, getting bullied in school and coming home crying in the rain and my mom making me a can of Campbell's Tomato Soup with some oysterettes. It was comfort food; that is what food should be. 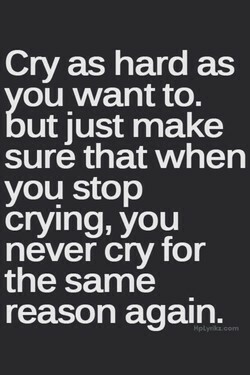 There was a point that I stopped crying. It's not just because I didn't feel pain anymore, not because I didn't feel sorrow. It was just to keep going. I mean, it just was to survive, to live. 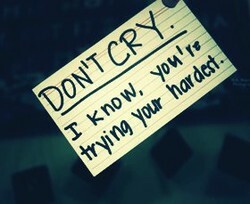 Every pore of you is crying and you don't even understand why or what. I actually kind of died and got born again as a result of taking the meds and having a chance to, you know, build a life. 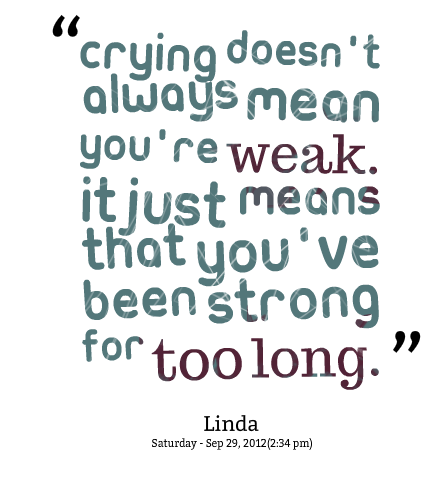 Maybe crying is a means of cleaning yourself out emotionally. Or maybe it's your last resort; the only way to express yourself when words fail, the same as when you were a baby and had no words. The crying need today is not for more laws, but for fewer. The world must be saved from its saviors. If the friends of liberty and law could have only one slogan it should be: Stop the remedies! 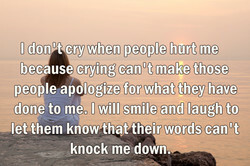 If one person starts crying, I'll cry. If one person has no money, I'll give them mine. If I had a bicycle growing up, I always felt incredibly guilty when I see someone sitting at the bus stop. Going from crying to laughing that fast and hard happens maybe five times in your life and that extreme right turn is the reason why we are alive, and I believe it extends our life by many years. It was less humiliating to admit crying because of your feet than because - because somebody had been amusing himself with you and your friends had forgotten you, and other people patronised you. The young woman was crying, in the way that grownups cry, keeping it inside as much as they can, and hating it when it still pushes out at the edges, making them ugly and funny-looking on the way. Some of my favorite movies have explored the father-son dynamic, in a very loving way. It can be complicated, but at the end, it's that moment where you're crying because of that core relationship. 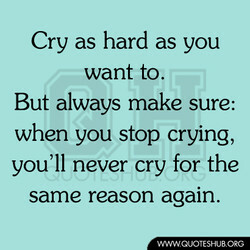 We've got to stop crying and start sweating, stop talking and start walking, stop cursing and start praying. The strength we need will not come from the White House, but from every house in America. You don't die. 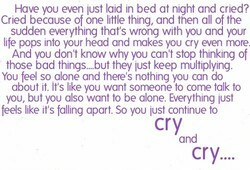 You just... get really angry and then after you're angry you hurt a lot and then the best thing is that one day you remember something she said or did and you laugh instead of crying. And your eyes must do some raining if you're ever gonna grow / When crying don't help, you can't compose yourself / It's best to compose a poem, an honest verse of longing / Or a simple song of hope. It reminds me that no embrace will ever feel the same again, because no one will ever be like her again, because she's gone. She's gone, and crying feels so useless, so stupid, but it's all I can do. I couldn't stop bawling, watching the towers come down. it was a terrible thing to happen. And a terrible thing to realize that I don't sit though the nigh crying when such horrors happen all the time. And where the words of women are crying to be heard, we must each of us recognize our responsibility to seek those words out, to read them and share them and examine them in their pertinence to our lives. The Church and the world and women are crying for men, men who are developing their capacity and talents, who are willing to work and make sacrifices, who will help others achieve happiness and salvation. Dreaming was easier than screaming, and screaming was easier than worrying, and worrying was easier than crying, which was what she knew she would be reduced to if she didnât keep a hard eye on herself. I realized it in waves and we held on to each other crying and I thought, God we must look so lame, but it doesn't matter much when you have just now realized, all the time later, that you are still alive. This is ridiculous. It's been months and for some reason I just can't get over us. 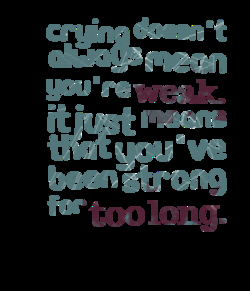 I'm stronger than this. 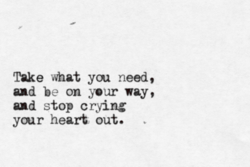 Enough is enough; no more walking around with my head down, I'm so over being blue crying over you. Economic justice is not just something blacks are crying out for; whites are desperate for it, too. But in the public imagination, the face of poverty is black. In all actuality, the face of poverty is white. I played football for seven years in Spain and was called everything because I was from South America, and I never went out crying like a baby, like Patrice Evra, saying that someone had said something to me. 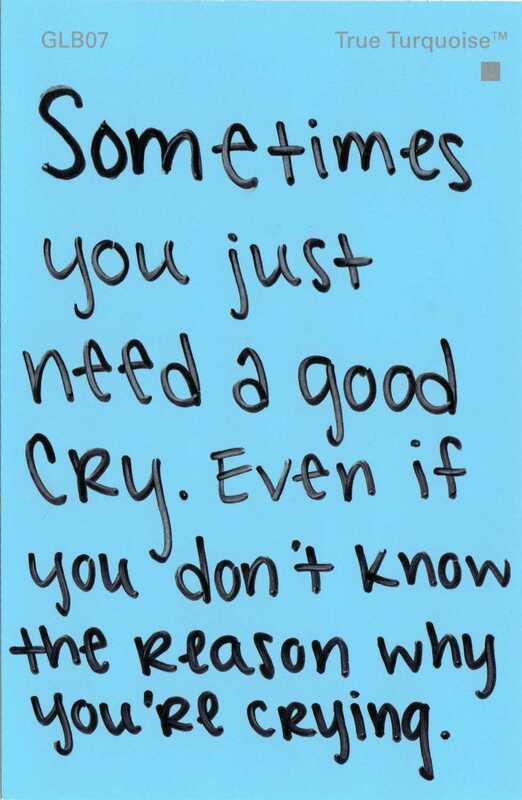 Some days I think she was really miserable, because she cried a lot. In a way, I'd had to steel my heart to her crying. You need to steel yourself to a lot of things when someone in your family is really sick. As I walk back to the school on my own, I realise I'm crying. So I go back to the stories I've read about the five and I try to make sense of their lives because in making sense of theirs, I may understand mine. I love how the soccer guys just fall when they get kicked and go baby crying.They try to explain to the referee like he's their mother: "Wah! Did you see what he did?" Then they get back to playing soccer again. 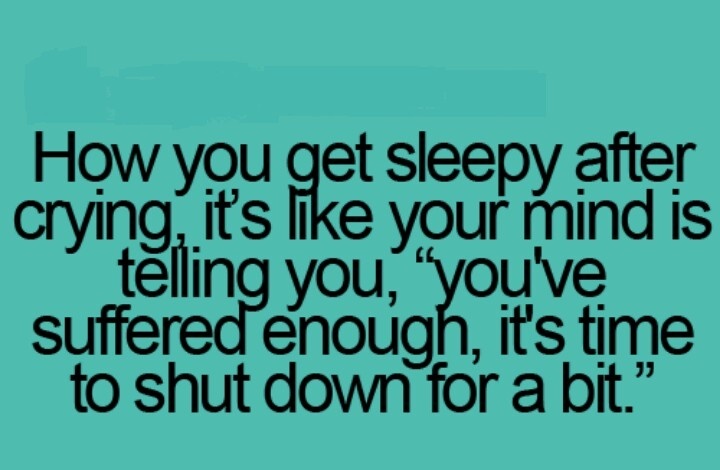 It was the kind of crying that comes from the pit of the stomach and brings a headache with it. The kind that makes a person snort and gasp, and no matter how idiotic you feel or how hard you try, you can't stop. The path of duty I clearly trace, / I stand with conscience face to face, / And all her pleas allow; / Calling and crying the while for grace, - / 'Some other time, and some other place; / Oh, not to-day; not now! People say that when a baby is crying the paternal grandmother will say, "The baby is crying, you should feed her," and the maternal grandmother will say, "Why is that baby crying so much, making her mom so tired? In Italy, kids are taken to restaurants very early, they're welcome there, and they learn how to behave. You don't see a lot of screaming crying kids acting out in a restaurant in Italy. They don't put up with that. You are so amazed by grace, you're not picking a fight with anyone, you're just crying tears of amazement that should lead to a heart for lost people, that God does indeed save, when he doesn't have to save anybody. I am back in LA now. And I keep thinking back to my time in New York after the bombings.... I was crying so much I could not see, and the other diners joined in, and I thought, What do you do with such atheistic evil? Dr. Oaks made the remark that, according to the best estimate he could make, there were four hundred murders annually produced by abortion in that county alone....There must be a remedy for such a crying evil as this. The kind of roles that I'm right for on stage tend to be quite young, and ingÃ©nue roles can be a little unfulfilling. They tend to fall into one slot: play the innocent young girl who comes on and does a lot of crying. I've never seen such a collection of idiots in my whole life.' Doolittle shook his head. 'If you participate in this lunacy, y'all will get yourselves killed. Then don't come crying to me.' Now that would be a neat trick. I had to learn quick, because I was performing in Cinco de Mayo festivals with babies crying and people lifting their beers, and you know the feather dancers would come, and they'd say, "What are you, a poet? You're next". To look at her, you might not guess that inside she is laughing and crying, at her own stupidities and luckiness, and at the strange enigmatic ways of the world which she will spend lifetime trying to learn and understand. My mother went to demonstrations. I remember her going to a big demonstration for Earl Brower and she came home crying and said the Communists were very mean and booed their people. I remember feeling sad at her feeling sad. The crooked little tomato branches, pulpy and pale as if made of cheap green paper, broke under the weight of so much fruit; there was something frantic in such fertility, a crying-out like that of children frantic to please. I've grieved enough for his life cut short and for mine for running on for so long with so little in it. It's weakness now, but I suppose I am crying out of a general sense of loss. Maybe I am mourning for the human condition. I didn't realize I was crying until it was time to say the blinding words. "I do,' I managed to choke out in a nearly unintelligible whisper... When it was his turn to speak, the words rang clear and victorious. "I do,' he vowed. Iâd never seen a man cry before, only on TV. Iâd never even seen Dad close to crying. Those tears looked so odd on you. It was like the strength of you just seemed to sap away. The surprise of it stopped me from being so scared. The sudden silence is horrifying, and it seems to catch my mother off guard. A tiny whimper escapes her, the sound amplified in the stillness. Surely, my father hears her now; surely he and I can't go on pretending she isn't crying. 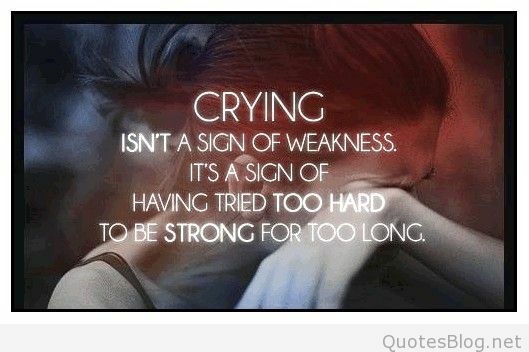 She cried a little, but only inside, because long ago she had decided she didn't like crying because if you ever started to cry it seemed as if there was so much to cry about you almost couldn't stop, and she didn't like that at all. 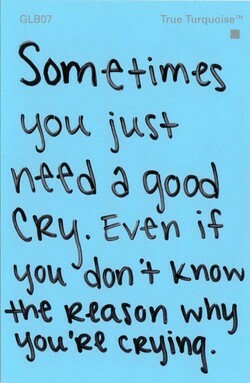 Talking to someone, meditating, praying, or just plain crying it out helps. The most important thing after doing any of these things is to let them go. I focus on all of the many blessings surrounding me and all those I love, instead. I'm not crying about anything or anyone in particular. The life I live I created for myself, and I wouldn't want it any different. I cry because in the universe there is something as beautiful as Kremer playing the Brains violin concerto. One of the hardest things in the world is to perform on record and get someone to enjoy and feel what you're doing. It's unlike, like TV you can, you can fake it with the face and the crying and the bits. Recording is completely different. What a pleasure to have children in Heaven and to watch them grow and develop without the Devil and all his imps around and without sin and the Curse and all the pain, sorrow and crying! It will be pure pleasure to have children in Heaven! I was crying when I was editing [Beacher] but I stopped all the screenings years ago because I had a headache but then I had seen it again... Well I always cry at the same place, when they play that song "Wind Beneath My Wings". 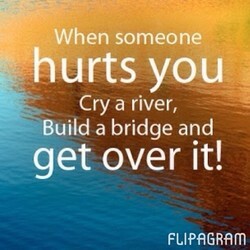 It gets you. Everyone has experienced laughing at a funeral, and not even inappropriately. It could be a response to a moment of absurdity or some fond memory. We're human beings so we understand that laughter and crying aren't always disparate emotions. It's blasphemous, don't get distracted by these lottery tickets and statues It's just fake gold and plastic We crying for votes but how many of us is on the board Better yet, when's the last time you showed up and supported the NAACP Awards? The thing about the Oscars is real life doesn't stop. You have to get back to planet Earth the following morning. The rubbish needs taking out. The kids will be crying. They'll need feeding. Kids do not care whether you've been to the Oscars! And Archimedes, as he was washing, thought of a manner of computing the proportion of gold in King Hiero's crown by seeing the water flowing over the bathing-stool. He leaped up as one possessed or inspired, crying, "I have found it! Eureka!". Looking silly can be ver powerful. People who are committing and taking risks become the king and queen of my prom. People are their most beautiful when they are laughing, crying, dancing, playing, telling the truth, and being chased in a fun way. 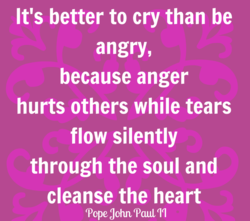 As for inflicting our sorrow on other people, one does not want to go around blathering and crying all the time. But perhaps it is our gift to others to trust them enough to share our feelings with them. It may help them deal with some of their own. 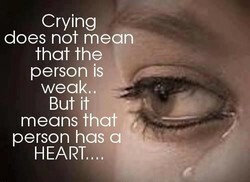 Tears are perhaps 1% water but 99% emotions. 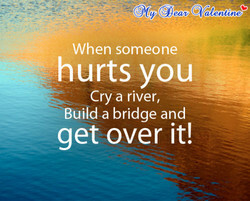 They contain hurt, pain, sorrow, disappointment, sadness"¦ so cry sometimes and let go of the feelings welling in your heart. 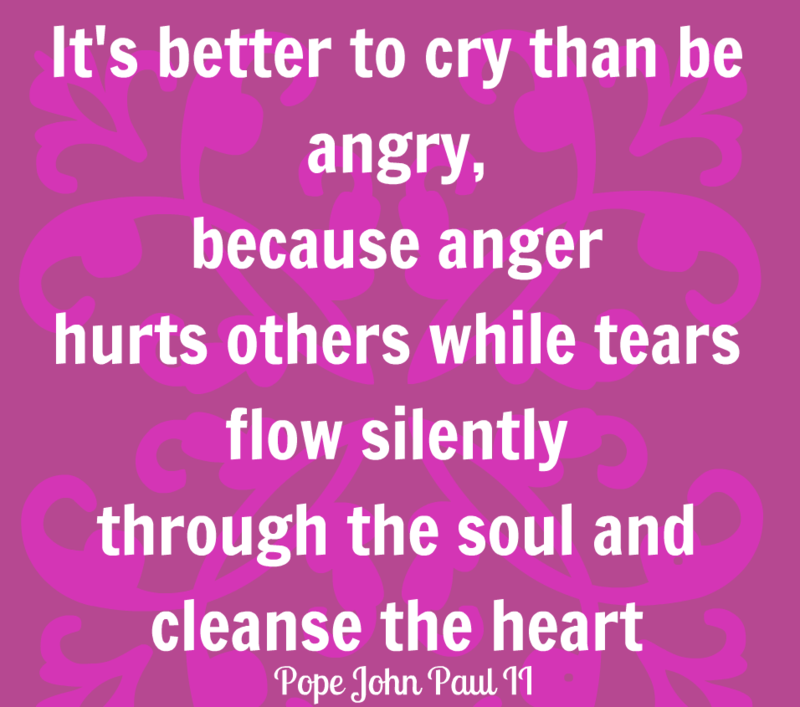 Crying won't necessarily solve your problems but it will make you feel better. The need for a quick, satisfactory copying machine that could be used right in the office seemed very apparent to me-there seemed such a crying need for it-such a desirable thing if it could be obtained. So I set out to think of how one could be made. 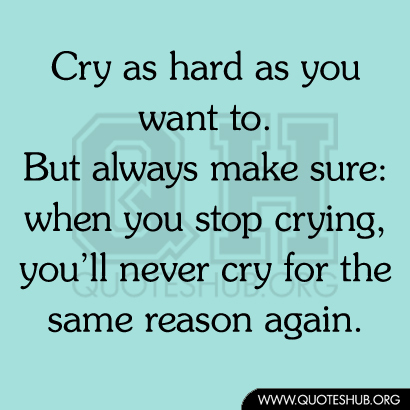 Real crying usually lasts two minutes or less, but may continue for five. After that point, the child is merely complaining... I would require him to stop the protest crying, usually by offering him a little more of whatever caused the original tears. I have very little interest in endlessly telling people about my artistic process. 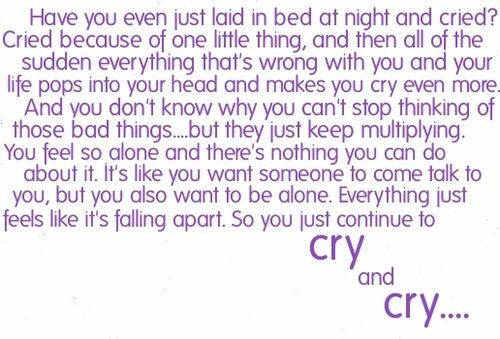 It sounds like throwing yourself against a wall and crying. It's not interesting to most people. It's interesting to yourself. But it's your problem, not anyone else's. We [Latinos] must be proud. We have the same rights in the U.S. as anybody else. Instead of crying and getting upset about visa problems and having our families come join us, go fight for your rights. Make yourself a productive individual in the society. I remember one particular moment (I don't actually know how old I was, but I guess around 7 or something like that) when I remember actually weeping. I was by myself in a room in the house, and I was just crying because I realized how much Jesus loved me. I went through various phases of different accents - I get ridiculously obsessed with different accents, different regional ways of using the voice, different types of singing. It's all tied together. Speaking is a kind of singing, as are crying and laughing. He was weeping. Although 'weeping' really is to small a word for the activity the kind had undertaken. Tears were cascading from his eyes. A small puddle had formed at his feet. I am not exaggerating. The king, it seemed, was intent on crying himself a river. It's a political and manipulative industry. Actors vie for the same roles, movies are snatched away. Have I ever been manipulated? Yes. But I haven't manipulated anyone because if you think from the heart, you cannot be calculative. 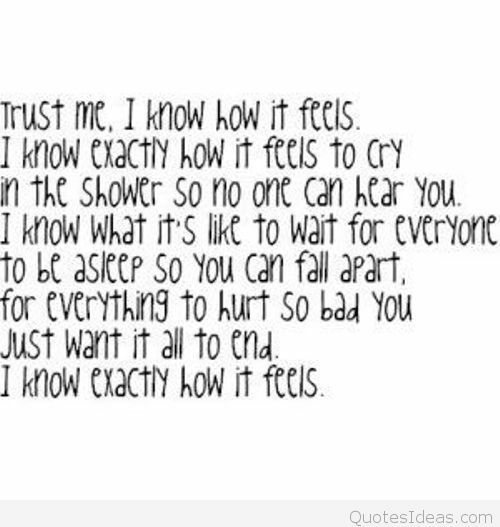 I have spent nights crying. She touched the healthy folds of skin around the baby's neck, wrists, and thighs, the dark lines crying for life made in his forehead, and thought how people start with wrinkles and end with wrinkles, grow into their skin and then live to grow out of it again. Men perish with whispering sins-nay, with silent sins, sins that never tell the conscience that they are sins, as often with crying sins; and in hell there shall meet as many men that never thought what was sin, as that spent all their thoughts in the compassing of sin. Candid and searing, Deborah Jiang Stein's memoir is a remarkable story about identity, lost and found, and about the author's journey to reclaim"and celebrate"that most primal of relationships, the one between mother and child. I dare you to read this book without crying. Ecstatic over the total annihilation of the Earth, Dr. Strangelove "resurrects" himself, miraculously regaining his ability to walk. His mechanical, robot-like body rises out of his wheelchair, crying exultantly: "Sir! I have a plan. Heh." (He realizes he is standing up.) "Mein Fuehrer, I can walk!"